When I'm not writing about economic multipliers or working on other things ... I've written a few other things. It's an odd mix: Many are mini eBooks and a brief description of some of them can be found near the end of this page. Acupressure … (mini, mini eBook) … describes ONLY ONE slightly modified acupressure technique to prevent sinus pressure buildup by 'assisting' the drainage process. Effective Meetings & Teams … (mini, mini eBook) … a Team Assessment Guide and a Meeting Assessment Guide (Six Elements to Making Meetings Work) to help identify if you might have problems. 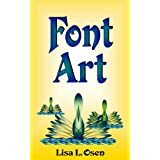 Font Art … an array of ideas as to how different font styles and font characters can be used to create elegant designs … for banners, for headers, for decorative elements or complete works of art. The swans on the cover were created using only two font characters with a bit of help from a font and word 'enhancement' program. Kids Teaching Kids … (mini, mini eBook) … empathy, language skills, greater depth of knowledge in any area, greater understanding of 'missing' knowledge, repetition, the ability of adults to ultimately teach their own children, the development of patience and good communication and reading skills … (from a 1998 paper). The Nature of Observation: Two Saltwater/Wicking Experiments … (mini eBook, mostly photos of two experiments) … for those interested in how salt water evaporates or solar distillation systems … how wicks can be used to help keep systems clean while increasing evaporative surface areas and the potential for using wicks as siphons for even greater value. Smart Children-Poor Readers: Using Audio/Text-Based Learning for Reading, Comprehension and Language Development … (mini, mini eBook) … the value of audio material for all children and adults … access to content, focus, listening skills, the value when learning a second (or first) language or when working to prevent attention deficit disorders. Solitary Confinement: Connecting the Dots Creates an Ugly Picture … (mini, mini eBook) … how 'solitary' can affect any child's or adult's ability to fit in … anywhere … The premise: You should never leave a person alone with their thoughts if you know they have thoughts which aren't worth thinking. Stolen Lives: A Tribute to Shadows … (mini, mini eBook) … This (rather lengthy) poem is a tribute to all those who have ever felt they have 'lived their lives in the margins' … in the places where people could not see them. True Leaders, in Following, Lead from the Side … (mini, mini eBook) … a very short synopsis of some thoughts on leadership. Understanding Electricity in the Grid (Just a Little Bit Better) … (mini eBook) … why the length of the wave is important, sine curves and unit circles, wye and delta connections and grid efficiency, balancing loads to prevent stray voltage. Visioning for Success! (eWorkbook) … worksheets (along with guidance text) originally licensed to school districts to help kids (and adults) find their place in the world … painting techniques, stepping into techniques and videotape techniques along with an array of self-assessment questions. Visioning for Success! (eBook) … BIG visions and little visions … a slightly updated version of the trade paperback published in 1997 … with the worksheets found in the eWorkbook, the painting, stepping into and videotape techniques and much expanded text on how cheating and BIG and little visions impact the world we live in. What Makes a Person Wise? … (mini, mini eBook) … a very short synopsis of some thoughts on wisdom … knowing that I am not always able to follow what I consider to be good advice.